Cleaning your windows takes you a too much time and efforts? You can do something different now – just call our customer care operatives and order our window cleaning in Harlesden. We will deal with this nuisance for you and the final result will be perfect for each part of your windows – glass surfaces, frames and ledges. With our help, you will have the opportunity to do everything you like with the time you normally spend for window washing. But our services will bring you even more, as you can notice from our list of advantages. We also provide our professional services in nearby areas: Willesden, White City, Bedford Park, Shepherds Bush, Brent. With our experience and workmanship, the good look of your property will be accomplished quickly – the adepts of commercial window cleaning will manage with this matter. 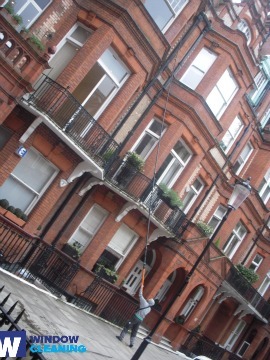 We employ water-fed extension pole system for quick and effective window cleaning, up to the fourth floor. For taller office buildings, we use up-to-date rope access methods. With our gear, we are able to reach the highest glass panes, even on the the highest buildings London is so famous about. From small shops to towering business edifices, we ensure second-to-none services – call, now! We provide first class window cleaning by using advanced methods. We provide gleaming and absolutely clean look for your glass surfaces, roof windows and greenhouses with water-fed extension pole system and high pressure cleaning. The poles we use are attached to water supply in our vans, thus excluding the risk of damage to the exterior of your home or business premise. What's more, we use completely safe rope access methods to clean glasses on high-rise buildings. You can benefit from these methods today – phone us on 020 3746 3113! You can always rely on our workmanship and dedication for residential and business window cleaning. Our competence allows us to clean all types of windows you could possibly have at your property. For instance, you can apply for cleaning of small or double windows, sash ones, French doors, bay windows and patio doors. Besides that, we include conservatories and skylights as part of our process. So to speak, you can fully enjoy the good look of your windows with our swift and reliable services. Book our swift and dependable domestic window cleaning in Harlesden. We can clean the windows of your property both inside and outside. The solutions we use are environmentally friendly - you will love the great end-results and be ecologically responsible. Moreover, we use only purified water. Don't wait, call 020 3746 3113 and order our top-notch services. Our customer representatives will guide you – they are on-call 24/7. We have other ways of booking – our request-a-service online form or just chat with our operators.